Tom has 24 years working experience in the industry. 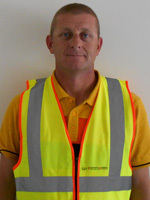 He has worked with BAM Contractors since 2005 as a Health and Safety Coordinator. He has responsibility for the development, implementation and maintenance of the HSMS company wide, encompassing all sites and activities, in accordance with the international standard for EMS, ISO 14001 and 18001. Tom joined ICME as a Senior HSE Manager on the New Al Ain Hospital Project in March 2015. He has been based in the United Arab Emirates since July 2012 for BAM International on the prestigious Hazza Bin Zayed Football Stadium and Mixed Use Development projects Phase 1/Phase 2 as a HSES Manager. Tom offers expert knowledge and skills in order to generate and promote a positive health and safety culture. He has excellent communication, management, and interpersonal skills.